One rupee. What can you get for it in today's India? Perhaps even an India of ten years ago? Ask the relatives of patients at the Erode General Hospital in Tamil Nadu and they will give you an astounding answer. You see, one rupee ($ 0.00014) gets them a full meal of rice, vegetable curry, sambhar and rasam. The person to thank for this sits in an unassuming lunch home called Shri AMV Homely Mess. V. Venkataraman's heartstrings were stirred a decade ago when a woman came to purchase idlis for her family while her husband was in the nearby hospital. She was dejected when Venkataraman informed her that the idlis she requested (6 pieces for Rs 10) were over and shook her head when he offered her dosas instead at 3 pieces for Rs 10. Dejected, she informed him that three pieces would not be enough to feed the 'entire family' who were there in the hospital with her. 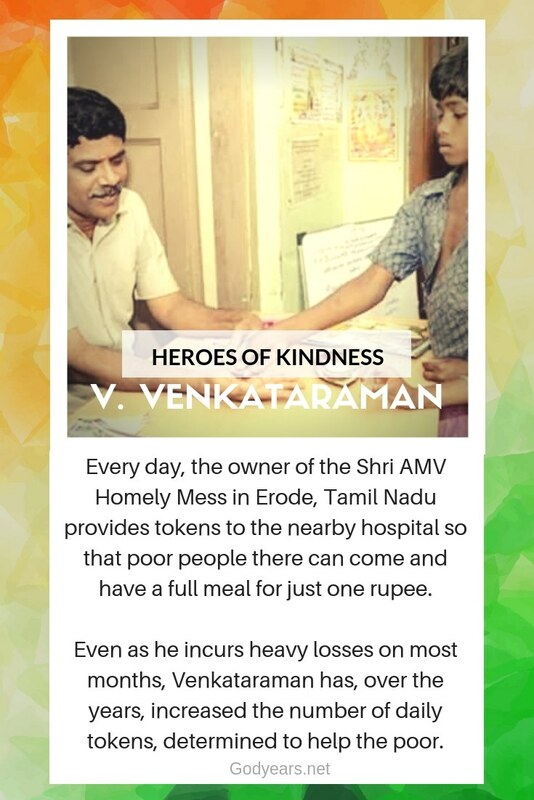 Moved by her plight, Venkataraman gave her 6 dosas for 10 rupees but the incident left its mark on him. His visit to the hospital the next day opened his eyes to the pitiable condition of the patients. Mostly belonging to the lowest income group, they could barely afford the medicines there. A hospital stay meant that the earning member lost a critical day's worth of money which was often needed to pay for food for the entire family. Even if the hospital could offer free food to the patient, it still meant that the family members who stayed with the patient went hungry. One Rupee for an Entire Meal! Venkataraman knew he had to do something. Determined to help as much as he could, he made tokens worth Rs 1 and took it to the hospital to give it to the needy with the aim that they could hand it over at his mess for a full meal. He deliberately chose not to give it for free so that people would not question the quality or consider it wasteful surplus being given away. Initially, this led to further pain for him as there were hundreds of people in the hospital jostling for the 20 tokens Venkataraman could afford to spare. Instead, he took the help of the medical staff in the hospital to identify those who needed the tokens the most and hand it to them. Today, Venkataraman gives away 70 tokens: 15 for breakfast (3 dosas and 2 idlis each), 30 - 40 for a full lunch and 15 for dinner ( dosa / chapatis with curry.) He provides takeaway packets too so that the food can be taken to the hospital and shared. The selflessness does come at a price. The profit margins for the mess are often very low and even negative at times and the house survives on the money earned by his wife, a yoga teacher. Venkataraman actually could not afford to pay for his second daughter's college education and had almost given up before a group from the city took note of his deeds and paid the admission fees for his daughter. And yet, his own poverty does not deter Venkataraman in the least even today. In fact, his aim in the coming years is to increase the tokens to 100 a day so that at least a hundred families get fed a full meal every day... for a hundred rupees. You can find the AMV Mess run by Venkataraman on Google Maps here. You know how to find the most inspiring stories, Doctor. I've said before - it conflicts me so much to see the best of humanity vs. the worst. May Venkataraman be blessed abundantly. As with the other story, the one questions I have is how can we help him--is there a way to fundraise for his endeavor? Maybe we could find a way to help him out--I'd be happy to support his excellent cause, as I'm sure will many others. I have exactly the same question as Damyanti, Roshan. Maybe we could do something together, Damyanti? God bless him! Is there anyone we can donate to his cause? I'd be happy to. Wow! Such an inspiring one. Thank you for sharing. People like him make me think that not all is bad in the world.